India with Kids. Sweet Mysore pak and other good things! We decided against visiting more monuments during our second day in Mysore. Rather, we chose to visit the Devaraja Market and the downtown area. The market area is absolutely fascinating – fruit and vegetables, flowers, rice, jaggery and Rangoli paints are mainly what we saw. 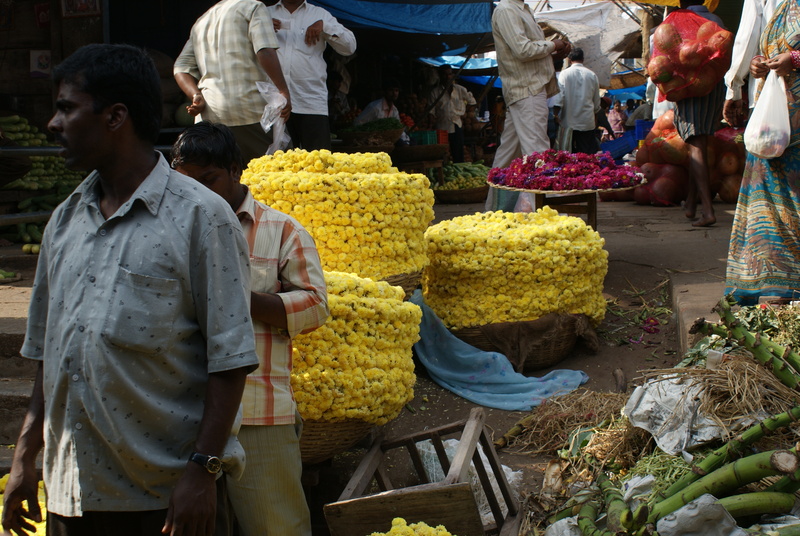 We walked through the flower market during auction time – hundreds of booths literally overflowing with all kinds of flowers, many destined for use in temple worship and for garland making. Our greatest discovery was Mysore Pak – a famous local sweet. The kids just loved it and we bought squares of it wrapped in paper, still warm from the fire. Mysore pak has a lot of ghee and is very rich and ranks as one of the best sweets we have ever tasted. Up until now, we had been very careful about the food we ate. We only ate in restaurants and even brushed our teeth in bottled water. But in Mysore we let our guard down for the first time and bought giant cucumbers and pineapples from street vendors who peeled them in front of us, sprinkled on some spices and served it in newspaper. We also bought delicious freshly squeezed sugar cane juice. We were starting to feel at ease in India. We explore the bustling “downtown” and went into numerous silk shops, silk being a Mysore specialty. We found a bookshop with more cartoon stories for the kids – by now they were really interested in so many things that we had seen, from temples to palaces to the various gods, all topics covered in the books. We also went into a supermarket – we love visiting supermarkets in different countries – it gives a great perspective on the everyday life of local people. I have been to supermarkets in countries as diverse as Japan, France and now India, and they are alway fascinating. The kids were interested in seeing what “junk food” (such as chocolates and chips) and toys were available, and I bought Neem toothpaste, something that I would never see at home. We bought some of the little copper bowls that food is served in throughout the South, and we were shown the various ingredients of some of the dishes that we were eating every day, such as upma, which we had grown to love for breakfast. We also visited the government silk factory which was amazing – thousands of automatic looms working all at once in huge rooms, some looms with gold thread for weaving into the borders of Saris. It was incredibly noisy but a sight to see. We saw the dyeing vats and various other parts of the complicated process that is silk and sari manufacturing.On the other hand, the Sandalwood factory was a waste of time -derelict and nothing to see at all. Back in town, we went to a Toy Exhibition. Specially for Dasara, beautifully painted wooden toys from all over the state were on display, and some were for sale. We bought soldiers and elephants for the boys. Some of the toys are shown on the heading of the blog page. We also bought a small sandalwood elephant as souvenir of Mysore. We popped into an “emporium”. These are stores that offer crafts from all over India. All the emporiums we saw seemed to be staffed by people from Kashmir – the pros were good, clean toilets and the free drinks we were given, but the prices were out of our budget range. At the end of the day it was back to our hotel, Sandesh the Prince. I took the boys for a swim at the pool while the girls went off for a massage. For some reason the pool was surrounded by incredibly slippery tiles and Eitan (our three year old) slipped and fell on his head. He was ok but we were lucky. It’s little things like this that can destroy any trip. The feedback on the massage was mixed – one fell asleep (= success) and one was in great pain (= failure). We loved our second day in Mysore – just experiencing India as it is. PS These days I’m planning great family trips to India myself. For more info on what I can do for your family, visit here. Previous PostIndia with Kids: An Indian Safari! Next PostIndia with Kids: Wonderful Mysore!